Fund says early warning gives ‘plenty of time’ to find a successor. 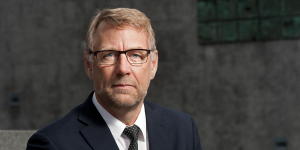 The chief executive officer of Denmark’s healthcare pension fund announced his plans to retire in 2020. Peter Damgaard Jensen will stick around at the $41.6 billion PKA plan until next April, after his 66th birthday. Jensen has been the head of the pension company for almost 20 years. He started with the organization in 2001. The fund invests on behalf of five health plans within the sector that cater to different related professions. The average portfolio allocation is 17.4% government and mortgage bonds, 11.4% high yield bonds, 6.2% emerging market sovereign bonds, 26% stocks, 2% emerging market shares, 9% private equity, 8% infrastructure, 11.8% properties, and 10% hedge funds. Stephanie Lose, the fund’s chair, said Jensen was “at the heart of the positive development PKA has undergone,” and appreciated his work as well as the timing of his decision, which gives the fund “plenty of time” to find his successor. Jensen is actively involved in environmental, social, and governance (ESG) activity as well. He chairs the Institutional Investors Group on Climate Change and has been on the group’s board since 2013, becoming chair in 2017. The 169-member coalition representing more than $25 trillion in assets aims to push investors toward greener investment decisions. The organization had a hand in launching the Climate Action 100+, an institutional call to action pushing for governance improvements and detailed climate-related disclosures from pollutant companies. He is also the chairman of retirement servicing company Forsikring & Pension’s board, as well as the vice chairman of both Maj Invest and Forca. Jensen has also been a board member of Danish venture capital and private equity firm Axcel since 2002. “PKA is today in a strong position, where we create great value for the members, while making a positive difference to our surroundings through our investments,” Jensen said.